It has been shown that DNA adaptors linked to reactants can direct small-molecule synthesis: if two reactants are linked to complementary oligonucleotide tags then hybridization of the tags ties them closely together and can greatly increase the reaction rate. The DNA does not participate directly in the reaction; its role is to increase the effective concentrations of the reactants. 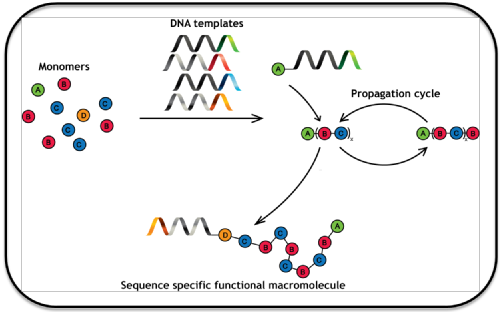 The rate enhancement can be sufficient to ensure that cross-reactions with other molecules present in the same vessel but not connected by DNA tags can be neglected. Multistep synthesis has been demonstrated using templates comprising separate regions to control the binding of multiple tags; cleavable linkers have been used to allow separation of tag from product. Sequential multistep synthesis can be controlled by sequential addition of reagents followed by purification at each step, or by controlling stepwise changes in the secondary structure of the template by progressively increasing the temperature. The use of a single DNA template to immobilize multiple reactants near a single reaction site limits the number of coupling steps that are possible. In our work we want to use DNA-templated chemistry alongside the creation of a molecular machine to build new materials under software control. The output of the machine will be chains of building blocks linked by covalent bonds. Our machine is modular and is designed to accept many different building blocks, from small molecules to nanoparticles, with a wide range of physical and chemical properties. The target sequence is encoded into an instruction tape which can be read by the machine: the tape is itself a molecule, a synthetic DNA oligomer. 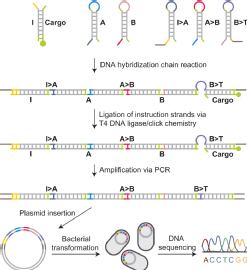 The target sequence of building blocks is automatically converted into a control sequence of DNA bases, and the tape is produced by commercial solid-phase synthesis. The job of the machine is to read the instruction tape and to form the bonds between building blocks in the specified sequence. 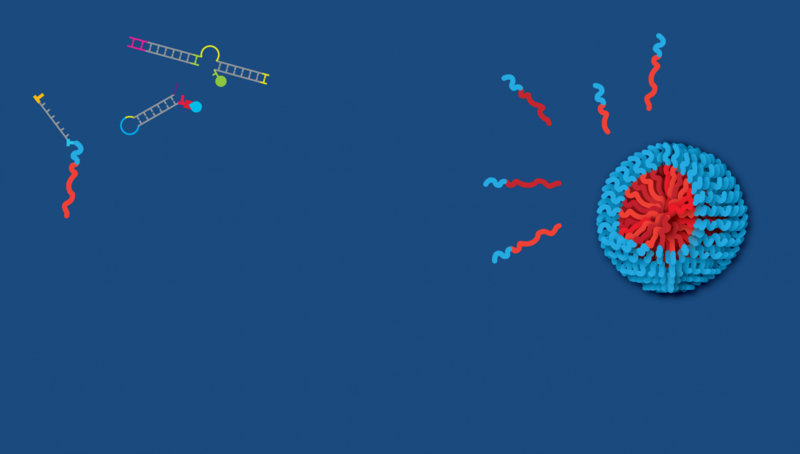 We are interested in using these DNA mechanisms to allow for controlled oligomer formation using DNA templated chemistries and novel DNA mechanisms.